Posted on October 26, 2016 at 5:25 pm. Tis the season for tricks and treats, of which there are plenty to be had at Australia’s best real money casinos as Halloween draws nigh. Free spins, cash bonuses, instant prizes – take your pick with these exclusive Halloween promotions from some of our top-ranked casino sites. Real money pokies players can win up to $5000 this Halloween at Leo Vegas – our number one online casino for Australians. All you have to do is play your favourite desktop and mobile casino games with AUD real cash credits between now and 10am AEDT on Tuesday, November 1. Every $10 you deposit and play through will earn you a ticket into the grand prize draw, where one lucky punter will win a $2500 cash bonus. The winner can then double that collect to $5000 on the Trick or Treat bonus wheel at the Leo Vegas Celebrity Blackjack Party table. You don’t have to win the draw to take home a sack full of Halloween goodies, however, as there are hundreds of free spins and instant bonuses to be won at the Chambre Separee live casino. These specials deals are only available to Leo Vegas members, so sign up today and boost your Halloween betting balance with a 200 per cent deposit bonus. No internet casino is more appropriately named for the spooky season than Guts.com, and the Carny Cash Halloween prize draw perfectly encapsulates the grotesque, freaky nature of the holiday. Bet $20 or more on the Twisted Circus online pokies game at Guts between now and November 1 to earn entries into the $1500 main prize draw. The minimum $20 gets you one ticket, while $40 returns three entries, $60 gets you five and $80 is worth seven tickets. If you spend $100 or more, however, you will be rewarded with a berth in the exclusive $4000 VIP grand prize draw. Top prize in the high roller raffle is $2500, while the third and final place in the main draw is good for $250. Now is a great time to join Guts Casino, where new players can score up to $400 in bonus cash and 100 free spins on Net Entertainment’s popular Starburst pokies game. Roxy Palace Casino is getting into the spirit of the spooky season by offering a whopping $20,000 in bonus cash treats. 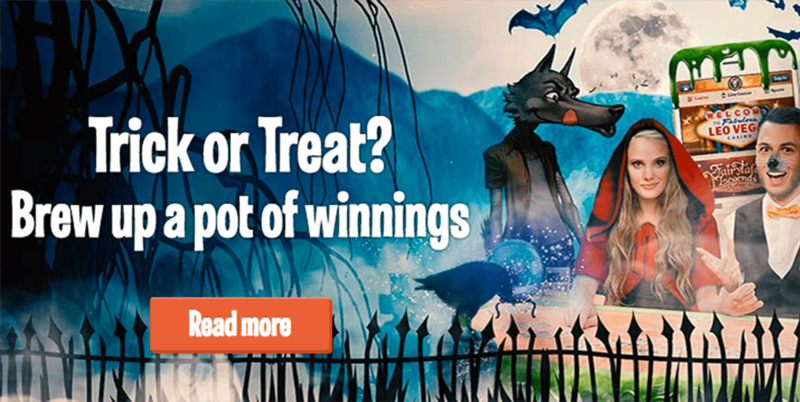 Play your favourite online pokies games for real money between now and November 1 (midnight October 31 UK time) to earn points for the Halloween Howler leaderboard. The more bets you play, the more points you earn – and the more points you earn, the higher up the leaderboard you go. The top 100 players at the close of the promotional period will share $20k in casino bonuses, $5000 of which will go to first place. All you have to do is log in at RoxyPalace.com, opt in to the promo and start playing real money slots to earn leaderboard points. If you don’t already have an account, follow this link to register at Roxy and kick start your Halloween bonus trail with a $350 welcome package.